Back in 2009 the European Commission set an agenda to phase out inefficient light bulbs, encouraging the adoption of more energy efficient alternatives. The idea was that if a suitable, more energy efficient option is readily available then the old predecessor will be removed from the market so its use is phased out. Affordability: If new alternatives are considerably more expensive than the old technology then it would be unfair for users to pay out more to maintain the lights they rely on. Affordability is also linked to whether or not the supply of new bulbs can meet the demand. Performance: Are the new alternatives able to do everything the old bulbs did? Performance looks at whether or not they are dimmable and can work in the same operating parameters. Equivalence to existing models: Are replacement bulbs able to produce the same light output, colour and quality of light as the predecessor? Compatibility: The new model needs to work as a direct replacement for the old, minimising changes to the fitting or control gear. Do the new models have equivalent dimensions? Over the last few years EC bans have brought about the demise of common household incandescent bulbs. And more recently incandescent bulbs used for special purposes such as rough service, or high and low temperatures. Next on the EC hit list is mains voltage halogen bulbs. Mains voltage halogen bulbs have been split into two groups, directional and non-directional. 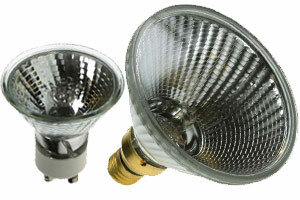 Mains voltage directional halogen bulbs includes GU10, PAR and Reflector spotlights. Mains voltage non-direction halogen includes GLS, candle, golf ball and globe shapes. On the 1st of September 2016 a ban on all mains voltage directional halogen bulbs will come into force. The ban prevents the import of these lamps into Europe so we will be able to supply the stock we have. To see our current stock follow each link to our GU10, PAR and Reflector categories. A ban on non-direction halogen has been delayed and is expected in September 2018. This is because the EC agreed with the lighting industry that suitable replacements did not meet the required criteria listed above. The lighting industry has similarly said that this is the case with directional halogen but following a vote the EC upheld their decision to continue with the ban in 2016. We agree with the lighting industry and think consumers may find it difficult to source quality LED replacements for direction halogen without having to make compromises. We found this chart from Osram which perfectly demonstrates the point. Click the image below to open the full chart. Some LEDs are not available in dimmable versions and others have yet to produce the same light output or warm 2700K colour that the old halogens produced. In our LED section we have done our best to source quality retrofit replacements for all halogen and incandescent bulbs, and while the choice is limited we are constantly adding new products as they become available. We advise consumers to be weary of LEDs from unknown brands as the quality and reliability of their products could be questionable.